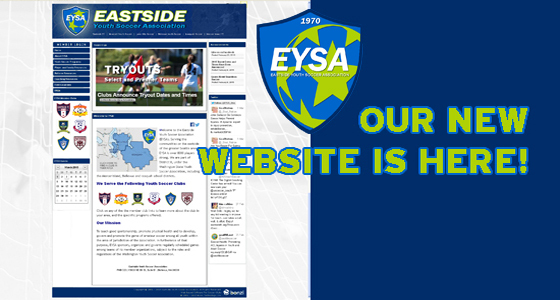 (Mar 6, 2015) We were overdue for a facelift, and just updated our website with the goal of ensuring all information is current, accurate and helpful in support of our mission to promote the game of amateur soccer among all youth in our eastside communities. All that remains is to update the site with our new logo and colors, scheduled to happen this week. Whether you're a player, parent, coach or referee, our site is designed to make it easier to get access to the information you need. If you have edits, updates or ideas for any area of our website you think we can improve, let us know at webmaster@eysa.org.